Hello! Thank you for your interest in Gablehouse Farm and Gardens in the Parkland region of Central Alberta, Canada. 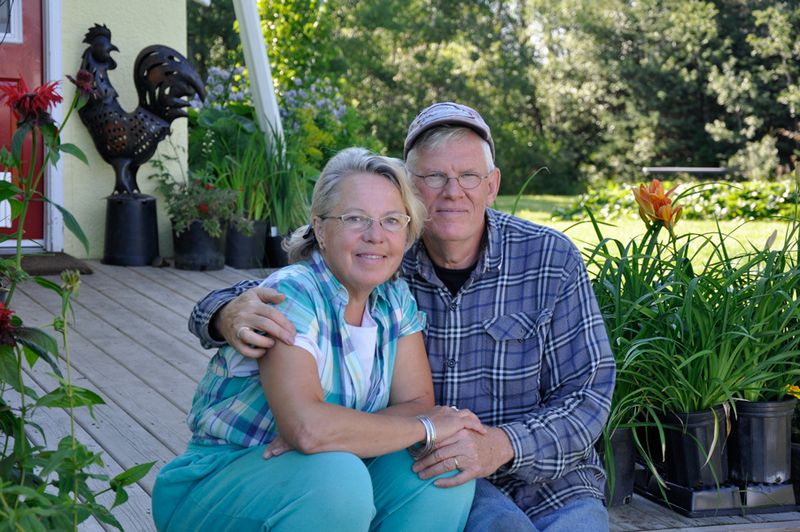 We’re Jeff and Carolyn Bondy, and this farm is our home, our work and our love story. The land for Gablehouse Farm and Gardens has been in Carolyn’s family for over 65 years. Some of her earliest memories are of tending flowers with her mom right in the same garden where we now grow daylilies. Now, as the second generation on this farm, we are proud to have dedicated a portion of the pioneer heritage of this land to our greatest gardening passion – daylilies. 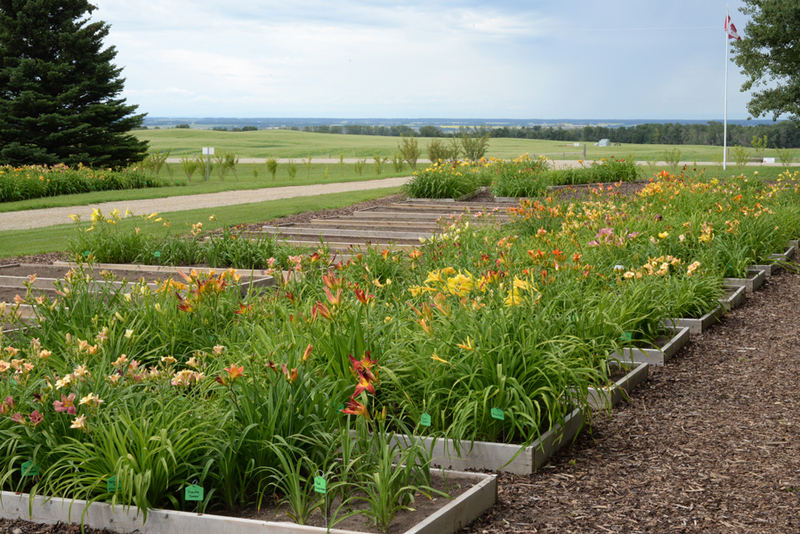 Here at Gablehouse Farm and Gardens we have over 450 different varieties of daylilies, making us the largest specialty daylily nursery in Alberta. We continually add to our stock but with great care and discretion. We sell only hardy, high quality, registered varieties. We search across Canada for unique daylily cultivars that have been hybridized, grown and tested for conditions in our northern climate (Hardiness Zone 2). You’ll find almost every color, size and shape you can imagine in our display and production beds. Carolyn and Jeff met in high school in Red Deer. Carolyn fell in love with Jeff and his artistic abilities to draw, sculpt and do the fine hand-work of silk-screen printing. At the time, Jeff didn’t know his passion for beautiful colors and working with his hands would one day attract him to flower gardening. Carolyn attended Olds College where she graduated with a double major in Production Horticulture as well as obtaining her journeyman ticket as a Landscape Gardener. Our mutual fascination with daylilies came about with a bit of serendipity, as so often happens in life. In 2010, we were at the Sylvan Lake Farmer’s Market and discovered one of the vendors selling a cargo trailer. We needed a trailer for the farm so we approached the sellers. We learned that the couple wanted to not only sell their trailer but their entire daylily business. They needed the money for a foreign services mission they had planned. Even though our primary interest was the trailer, we decided to buy the daylilies as well, to help them fund their charitable trip. We went to their backyard in Innisfail and dug up all their daylilies, hundreds of plants, to transplant to our own farm. Little did we know how smitten we’d soon become with these garden beauties! Since the purchase of that first daylily collection years ago, our knowledge and experience has increased an hundred fold – and we’re always willing to share our expertise with others interested in growing daylilies. Our hope is to one day develop our own Gablehouse Farm and Gardens hybrid cultivars. Our farm is open by appointment during peak bloom time each Wed., Thurs., Fri., and Sat. from July 15 to Aug. 15. We are central to many towns and districts – Rocky Mountain House to the west, Stettler to the east, Olds to the south and Lacombe to the north.